Much has been written of late about the impact Mitt Romney had through Bain Capital on the life of a steelworker named Joe Soptic and his now deceased wife. A reasonable question to ask is: Why is the media concentrating on the life of one couple, no matter how tragic their fate, when, according to President Obama, these people don’t exist? I’m sure it would be news to Joe Soptic to know that he doesn’t exist, but this is the new reality in the modern campaign. Joe Soptic lost his job. In Obama’s world, that means that you simply disappeared from the workforce. For the past few years, Obama only reports on people who have found a new job. You hear it all of the time, “The Obama Administration has created or saved 4.5 Million new jobs.” How can that statement be true when the workforce is actually smaller today than when President Obama took office? 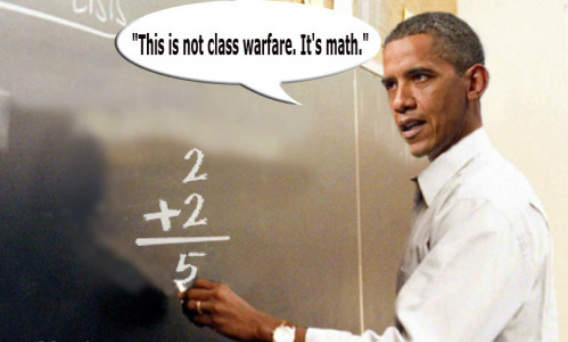 Welcome to ObamaMath. Under this new paradigm, if you are laid off from a job paying $200,000 annually and you manage to become a minimum wage employee at the local fast food restaurant, assuming Mayor Bloomberg hasn’t managed to shut them down, you count as a new job. President Obama is the most upfront politician ever in telling you that when it comes to losing your job, he doesn’t feel your pain. To him, you don’t even exist. I recently spent a little time looking at the companies that Bain Capital has invested in over the past couple of decades. There are literally hundreds of big-name companies, like Staples, Dunkin’ Donuts, and Burger King. Just a little conservative math shows that, by using ObamaMath, Bain Capital is responsible for the creation of at least 12 billion jobs over the past two decades. And President Obama has a measly 4.5 million new jobs over his entire lifetime. Even though Mitt Romney left Bain Capital over a decade ago, we know from the latest attacks that he still gets credit for anything that has ever happened there. Ergo, Mitt Romney is responsible for creating 12 billion new jobs†. And, do you even want to try and count the jobs he has saved? Just think, using ObamaMath, anytime you get a promotion, that’s a new job. If a new entry level worker gets added to replace you, that’s two new jobs. Both are the same according to this statistic, no matter what the difference in pay, hours, location, or benefits. Suppose the New York School system puts you on suspension after you assaulted your students. Voila! Two new jobs, yours was saved and one new teacher was hired to replace you. †The anonymous source for this number tells me he is also the anonymous source for Senate Majority Leader Harry Reid, so his credibility is unassailable. I have sworn to the death to protect his identity as the ultimate fountain of knowledge on all things Mitt Romney.